Zinc salts are often added to commercial lager, ale and stout fermentations – either as solutions of food-grade zinc salts or as a component of a formulated ‘yeast food’. The technique has a long history of safe use being carried out to increase fermentation rate, improve the extent of attenuation, improve yeast vigour and viability, and improve beer flavour through stimulating acetate ester production and avoiding sulphur off-flavours. Under some conditions, zinc addition can even help with diacetyl control. 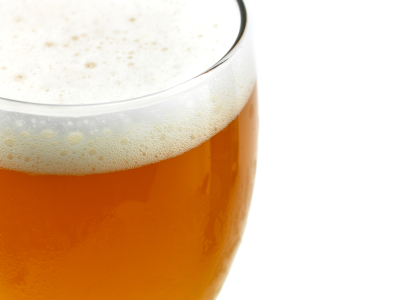 Wheat beers typically fall into three styles – German, Belgian and American. The first two styles use a certain type of yeast; strains which posses the ability to produce phenolic flavour compounds such as 4-vinyl guaiacol and 4-ethyl phenol. These flavours are an essential part of the profile of such beers. With the yeast strains used being so different, brewers are sometimes cautious in their use. In fact, many wheat beer yeasts have a reputation for being ‘high maintenance’ seemingly going down with the plague when the wort has only caught a cold. For this reason, brewers are sometimes reluctant to supplement wheat beer worts with zinc salts. But is this caution justified? Can wheat beers worts be usefully supplemented with zinc salts? 1. Raw materials – wheat is rich in manganese which interferes with the uptake of zinc ions by yeast – the more wheat or wheat malt you use in the grist the more zinc will be needed by the yeast. This, essentially, is the difference between the total zinc and the ‘bioavailable’ zinc. For the purpose of this post I’ll assume you’re using around 50% wheat in the grist. High wheat levels can reduce zinc availability and therefore slow down your fermentations. Under these conditions zinc supplementation of wort can restore the fermentation to normal speed and degree of attenuation. 2. Desired flavour profile – zinc stimulates production of isoamyl alchol by yeast which, in turn, leads to production of isoamyl acetate. This ‘banana-like’ flavour is very important to German wheat beer character, but levels in Belgian wheat beer styles are generally a lot lower. To an extent, the more zinc you add, the more banana flavour you’ll get. Regardless of how much isoamyl acetate any wheat beer yeast produced – and different strains produce different amounts – zinc supplementation of the wort will always increase its production. 3. The potential risks – too much zinc can cause some yeast strains to autolyse, so care has to be taken not to add too much. The levels of addition below recognize this risk. Similarly, if you intend to bottle condition your product by re-fermentation induced by wort (Speise) addition, you should not add the zinc salt to the wort used for the bottle conditioning. Add it only to the wort for your main fermentation. Incidentally, when brewing according to the Reinheitsgebot addition of zinc salts to wort is not permitted. However, some German breweries use a sacrificial zinc electrode in their lauter tun, or add the zinc to the fermentation via a zinc-enriched yeast (ServomycesTM) to get around this limitation. No slippery slopes please – we’ve got beer to make! Is there any negative impact on beer flavour stabilty if zinc sulphate is added? Is the timing of zinc to wort important? For example should I add zinc only during yeast pitching or in every brew of a multi brew fermenter? I’m liking the “sacrificial” zinc electrode – Is there a sacrificial DAP electrode commercially available?! Is there also a link between zinc levels and sulphur compounds?